If you thought 10/30 was an ill informed decision, then what about 15/40 for our schools? 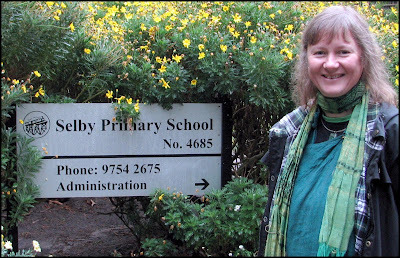 I learnt just over a week ago that Selby Primary School was going to be affected by tree removal works along with 31 other schools (28 of them in the Yarra Ranges). There was no detail, no explanation other than a quote from the DEECD “While recognising the significance and value of the trees to the school landscape, their loss is significantly outweighed by the safety of students and staff”. Once again we have a government who are making decisions to remove trees without any evidence that it will protect the safety of students and staff in the event of a bushfire. To make matters worse the school put out a newsletter saying the Shire of Yarra Ranges were aware of the clearing at schools – the only reason the Shire knew of any tree removal at any school was due to an outpouring of concern from many of the schools affected. Happier times at Selby Primary School. When I inspected a plan of the proposed removal of trees and vegetation at Selby Primary School I was very concerned. The plan did not delineate the boundary of the school and trees outside of the school boundary (not on school property) had been marked for removal. This is unacceptable, unlawful and leaves me with little confidence in the process used to assess vegetation at schools across the Yarra Ranges. 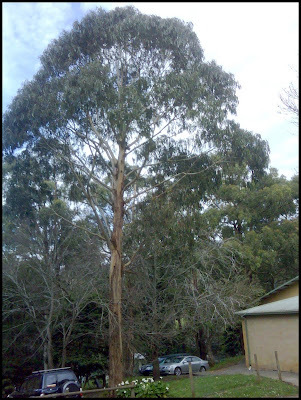 When I finally saw a plan of the proposed tree removals at Selby Primary I realised that 3 of the trees on the plan were Shire of Yarra Ranges trees, 30 metre plus stringybarks at that. As it turns out there are five schools where the boundary is unclear and there could be many mistakes made in identifying which trees are allowed to be removed. To date I have not received a direct response from the Minister or my local member and have no assurance that these trees won’t be removed, let alone provided with an explanation and evidence as to how this tree removal will protect the safety of students and staff. One of the trees scheduled for removal at Selby Primary School. School Principals and school councils have had no ability to provide genuine input into this decision, which in reality they have had no control over as the decision was already made for them, as expressed in the circular to parents ‘School Bushfire Refuges’. In the case of Selby Primary School should the tree removal plan be followed this will see the illegal removal of non school trees and liability of this transferred to the school Principal and school council. This isn’t good enough, it seems the government has carefully crafted the communication of its tree removal plans so parents have had little opportunity to respond before the start of the school holidays. Selby Primary School was inspected on the 4th August, some 6 weeks ago, allowing plenty of opportunity for consultation. I congratulate those school councils and principals who have stood up to the government on the 15/40 issue. Fire science principles do not support tree removal as an appropriate mechanism to protect students and staff, nor communities for that matter from bushfire attack. In many of the schools the trees proposed for removal are isolated, scattered trees with no understorey, usually paved underneath or bare dirt. Fire science says that these scattered trees are highly unlikely to contribute to any additional radiant heat or ember attack in the event of a bushfire. There is evidence to support that these trees may reduce wind speeds at a local level therefore reducing the severity of fire to surrounding buildings. Further to this the CFA recommends that a protective shield of trees be planted around houses to slow the wind, cut down radiant heat and catch flying embers. These principles should also be applied to our schools. Aside from closing schools on days of Total Fire Ban a genuine effort to reduce fire severity would be a continued effort to reduce fire fuel within school grounds. The CFA is also explicit in its definition of fire fuels: dead undergrowth, fallen branches, woodpiles, leaves in gutters, long dry grass, fallen leaves and twigs, anything smaller in diameter than your little finger is a fine fuel and it is these that must be removed to protect against bushfire attack. Trees provide our children with shade in summer and a rich and valuable learning environment. Trees also contribute significantly to the local amenity and habitat of not only the school grounds, but the surrounding areas as well. I have further concerns that the proposed tree removal will lead to a false sense of security with the future potential for tragic outcomes. Parents, students and staff not only deserve, but require an explanation and rationale for tree removal and the ability to input into decisions about their school. It is disrespectful to school communities, the principles of community consultation and open and transparent government to do anything less. Just looking back at this article, I still haven't received a response back from Minister Pike, I won't hold my breath.